I’ve been thinking a lot lately about pattern designs and the way I approach the process of creating a new pattern. 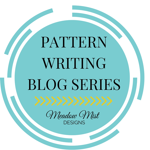 Cheryl at Meadow Mist Designs is hosting a pattern writing series, and I love it! It’s so much fun to share ideas and inspiration with designers who have been there, done that. This is only Week 2 in the series, so it’s not too late to join in the fun. Like most designers, I’m inspired by the world around me and often save quick sketches, scribbles and notes whenever an idea pops into my head. When creating the designs for my book, I was inspired several times to design a quilt based on the letters of the alphabet. The first time it happened was when I noticed the pattern on some steel plating, and realized that it looked like the letter I interwoven with itself. I played with that idea for a while, and eventually came up with a pattern I called “The I’s Have It”. My publisher did not like the name because they thought it would not translate well for the overseas market so it got changed to “Interwoven” because the pattern also reminded me of interwoven ribbons. I love how my longarmer, Cathy Franks, quilted this piece! I told the longarmers who worked on the book that they could quilt each quilt however they wanted although I did provide my thoughts. Kathy took my idea and ran with it, quilting a different pattern in the white area of each block. The Is she quilted in the ditch and back and forth a few times. Another time the alphabet inspired me was when I based a pattern on my artist’s signature. A long time ago in a galaxy far away (okay, we’re talking grade school here), I designed a signature for my artwork that combined my first and last initials. As you can see, the signature is a J and an F (yes, those were may initials then and now—how convenient! I played and played with this idea in Electric Quilt and the result was my pattern, Signature. My husband loves this pattern because he also sees his initial in it—the letter S. Once again my publisher suggested a name change to “Conga Line”. In my heart though, it will always be “Signature”. Signature was quilted by Julie Edwards using a swirly back and forth pattern in the white areas, and a triangle meander in the colored areas. What inspires you? Do you collect design ideas, and if so, how do you keep them organized? I'd love to hear from you! Newer PostSpring May Be Coming, But Where Was Winter?